Saturday was the day for the Komen Race for the Cure. I have run this event for a few years now, and it saddens me as each year I seem to know more and more women affected by breast cancer. Last year, I ran with two names on my bib, the wife of a good friend and the mother of another friend. 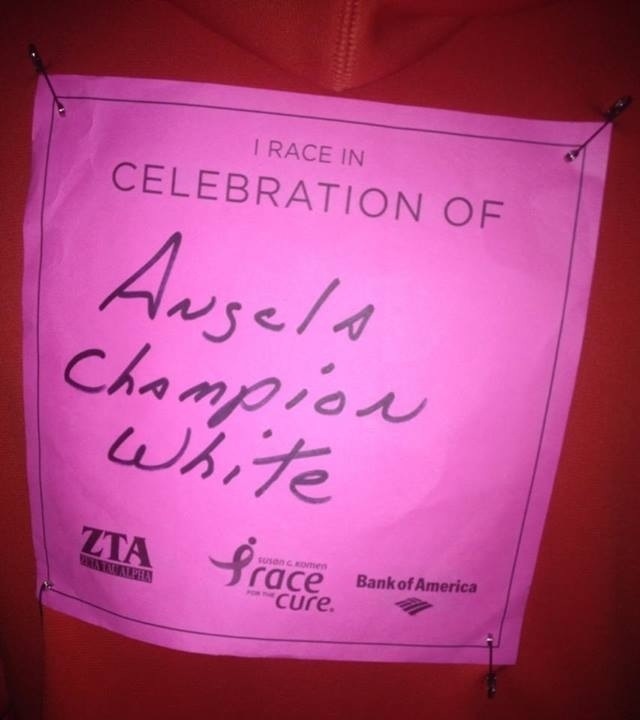 This year, I ran with one name, Angela Champion White, who is a friend from high school. When I wrote her name on the pink bib, I wrote it rather large for a couple of reasons; so that people who see her name and know of her fight even though she was a thousand miles away, and because that way there would be no room to add another. As if that would stop cancer. It didn’t work, as I discovered later. I found out that I have no fewer than six friends or acquaintances that are affected by breast cancer. But I was honored to share Angela’s name and her fight with others that will pray for her and care about her, even though she’s far away. hopefully she feels the love coming from others far away that know what her battle is like. Race morning was rather chilly, so out came the compression pants, the hoodie, and the gloves. I haven’t run in compression pants for awhile, so I was a little nervous about chafing. So far it hasn’t been a problem, so it looks like I’m set for the winter running season. My friend Jo-el met me at the race and introduced me to the group she was with. 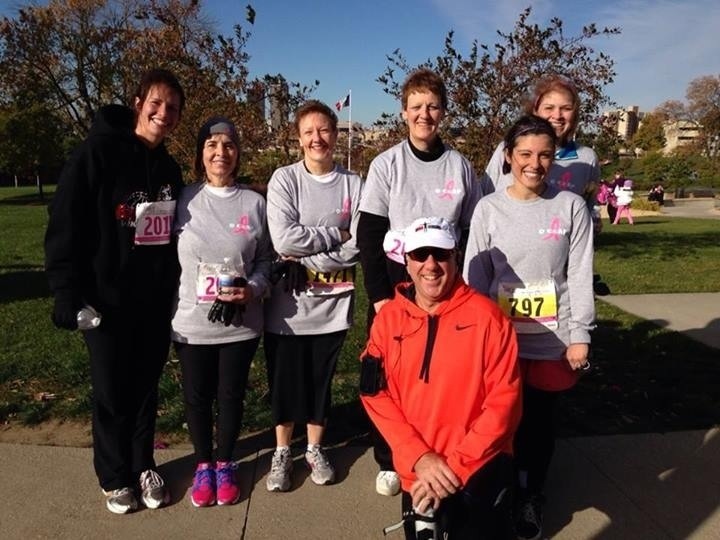 They are a great bunch of ladies, and I had a great time chatting and running with them. The race started and off we went. We weaved our way through the large crowd, and kept a decent pace. Even with all the people all over the place trying to make running straight an impossible task, we managed to find a section where we had some room to ourselves. Before we knew it, the capitol hill was upon us and we were done. I crossed the line and my watch showed 26:15. Not too bad a time for a week out from the marathon. I was happy to just be running again. God Bless you Angela. My prayers are with you. Keep fighting. Sunday October 20th, was the day. I could hardly sleep the night before, wondering how it would turn out, what might happen, and did I train enough. After months of training, hours and hours spent preparing for this one fleeting moment, it was here. The IMT Des Moines Marathon was upon us, and now it was time to see if all that training would provide the end result that I desired: to cross the finish line and forever be called a marathon runner. It would be something that could never be taken away, and is held by only 0.5% of the U.S. population. I finally got a little sleep, but was up at 5am, antsy and ready to go. I got ready and had just finished breakfast when I got a text message that was quite a surprise; my dear friends (and to me family) Kaye and Dirk were here to watch me run. What an awesome surprise to have them drive all the way from Burlington just to cheer me on. It ends up that they, along with my wife, were at 5 different spots to cheer me on. That’s saying a lot, given the road closures and detours because of the marathon. We picked up my dear friend and running partner Kara, and proceeded to downtown. We got together with the ICan running group, who I owe a world of thanks to. We found my other dear friend, mentor, and running partner Stephanie with the ICan group, and decided we would start the marathon together. Kara was running the half, so she moved toward the front of the line. 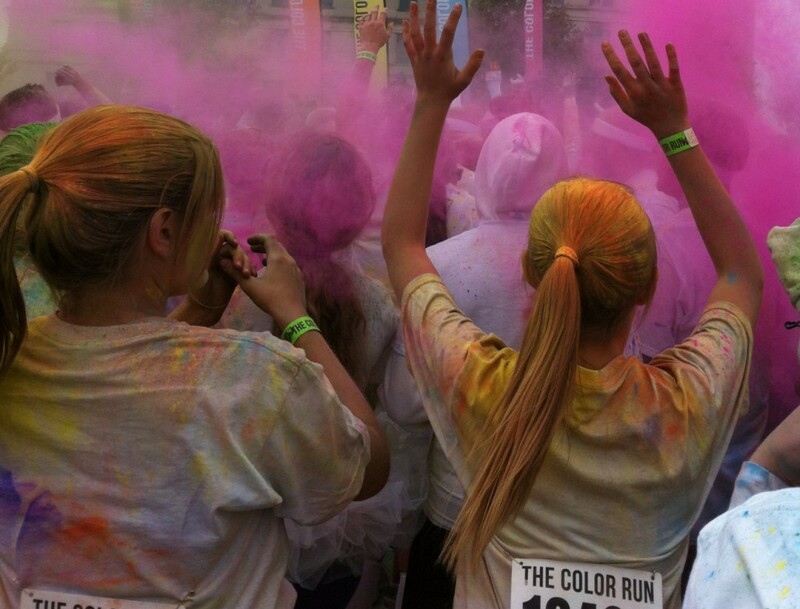 We stretched, said goodbye to our loved ones and made our way to the start. Before you know it, the race was on. Stephanie and I were separated at mile 5 because another in our group had to slow down and Stephanie stayed with them. It turned out that the lady had pains in her quad and had to stop. So Stephanie had to go it alone, as did I. You have a lot to think about when you run that far. The crowds, the signs, and the scenery was great. But after a bit it becomes something of a blur and your mind tries to focus on your body, on the pain it feels, on how tired it’s becoming. That’s when you need the crowds and the signs and the scenery more than ever, to keep yourself focused on anything but yourself. I did ok until mile 17, when I hit the wall. I had a pain in my hip that was persistent, but not enough to stop. All the other aches went away pretty quickly, but not this. It was begging me to stop this madness. By mile 18 and 19, I was questioning why this wouldn’t go away like the rest of the aches. Didn’t I train enough? Didn’t I do enough to overcome this? Why was this happening now, when I was getting so close? I decided to hell with the pain, I wasn’t giving up. I slowed my pace a little, changed my stride, and continued. By mile 20, it felt like the lower part of my legs were tingling, as if they were going to sleep. I chuckled to myself that was a good thing; as long as I remembered to pick my feet up, I wouldn’t feel a thing. I guess that was my version of “the wall”. Because at mile 21 it all stopped. The hip pain left, the tingling disappeared, and I was left with a body that said “Ok brain, you won’t stop, so I surrender. Where do you want to go?” At that point I knew I was going to make it, or fall over trying. The last 5.2 were slow but rewarding. I knew with each step, I was getting closer. Suddenly a spectator shouted “One more corner and you’re home.” I got to the final corner and could see that beautiful finish line. It was probably the slowest sprint ever, but I sprinted with all that I had left to that finish. I heard them call my name on the P.A. system and suddenly someone was handing me a medal. I was a marathoner. I made it. I could do it. I did it. It’s what we do, after all. PS: A special thanks to everyone who volunteered, cheered, helped, encouraged, mentored, trained, or offered assistance along the way to this milestone. To my wife, who puts up with the hours of training and the need to go to the running store nearly every weekend with a smile; Loran Storts and the ICan Running Group for letting me join them; to Stephanie my friend and mentor for her support and guidance, to Kara, Stacie, and Shelli, who are my running buddies; to Kaye and Dirk for leaving home at 3am just to stand in the cold to watch me run; to Suzan, who inspired me in the first place by watching her cross the finish line in a triathlon; and everyone else that is a part of this journey. When I look at the pictures and that shiny medal, I see all of you because you all were a part of it. Thank you! Today was the last of my long runs before The IMT marathon. To call it long is actually a misnomer; a six mile run is pretty short anymore. But I’m trying to follow Coach Loran’s training and taper. Isn’t it funny how as you progress as a distance runner that you use the word ‘only’ a lot when discussing shorter distances. I caught myself doing it yesterday when someone asked how the training was going. I replied “I’m tapering down, so I only ran four miles.”. Four miles used to be impossible. Funny how that changed, I didn’t even notice that it did. So today I was ‘only’ supposed to run six miles, so what better way to do that than with a 10k race. 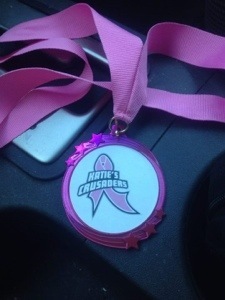 Katie’s Crusaders is a great group supporting the families who are dealing with breast cancer. So I headed out to Waukee and Centennial Park to get my run on. The event was well organized, and well staffed with volunteers. With the exception of a shaky start (no one was sure that we started), it was well mapped out, relatively flat, and with plenty of people to make sure you didn’t miss a turn (hopefully the ‘Dog Jog’ organizers read this). I also like the fact that there were points where a volunteer told you your time. I have a Garmin, but I like that idea, because not everyone wears a GPS watch. I finished the run and made my way to the refuel area. I passed on breakfast pizza and doughnuts and grabbed a banana instead. After that and a Gatorade G2, I was good to go, and went to check my time. I finished in 52:04, with an average pace of 8:24 per mile. 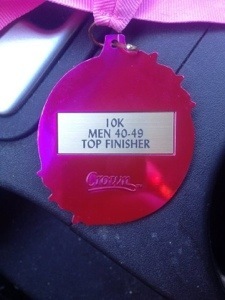 I was shocked to see that I finished first in my age division! I got a medal at the awards ceremony! What a way to go into my first marathon; strong and confident. Speaking of marathons, I have some people to thank before my first one. To my wife, for not only tolerating my countless hours away running, seeing the ‘latest gadget’ needed in the quest for fitness being purchased, and even carrying water on long runs for me; to Stephanie, for her unending support, advice, encouragement, and constant positive attitude, and for being my running partner; to Kara, for her helpful advice on proper eating, help with staying focused during a run, for her positive energy, and for being my running partner; to Coach Loran, for letting me tag along with his ICan training group, and for his great advice and help; to Shelli and Stacie, for being my running buddies and for always being supportive and keeping me moving forward. There are many more that I need to thank, positive and helpful people like Eric and Connie, Suzan, Jason, Kandi and others who have helped more than they know. Sometimes just a word of encouragement is all that’s needed. If I forgot anyone, I apologize and know you are in my heart! So, I may or not post until after Sunday. Depends on what happens, and how my nerves are coming up to the big one. Hopefully, I’ll be able to title it ‘26.2’. I tried something different today. My friend Stacie asked if I wanted to for a run at lunchtime. So I packed my bag and instead of sitting around at lunch, I changed and hit the road for a four mile run. It was a beautiful day and Stacie is a great running partner, as well as a friend. We ran from our building to Gray’s Lake, down to the silos and then headed back toward downtown. It was a quick four miles, or so it seemed to me. A great run and a great time with a great friend. While I enjoyed the break away from work, I also noticed something when I got back to work. After a quick shower and changing back into work clothes, I went to my office. But it felt different; it felt like It did when I first got to work early that morning. I was focused, relaxed, able to think clearer, and I felt better. It was a good feeling and I think I’ll try running again tomorrow and see if it feels the same. This may turn in to a normal routine if it continues. I like the refreshed feeling I had after the run. I liked getting away from work, even though I had my phone and was close. I also like the fact that I had my workout done before I got home. Since I’m supposed to be tapering, a quick four mile run is a great midday workout. When the marathon is done, I’ll probably have to split between short midday runs and longer evening runs. It’s been a week since the 20 mile training run. I felt pretty good throughout the week, but working late and bad weather reduced my weekly runs to only one 6 mile route. I felt pretty bad about not getting more runs in, as the marathon is only a couple weeks away. My mind is in overdrive, saying “you need to train” over and over. This was the opposite of what my brain was trying to tell me, to keep pushing, train harder. Coach Loran explained to me that if you push your body now, you risk injury and you do not give your body enough recovery time. You will not lose muscle memory or the abilities you have gained by resting and taking it easy for a couple of weeks. He pointed to one member who had not run at all that week. She wasn’t worried at all! We started out and the run was great. Once we started getting into the groove, it seemed as if we could go on forever. All during the run, I thought about coach Loran’s words and tried to get a handle on learning on how to relax. I guess tapering is as much mental as it is physical. Letting the body relax and heal while telling the brain to take a break as well. It’s ok to take some time to stop pushing the limits your body can take, to keep loose and easy, to stay the course before kicking it into overdrive again for the big event. I have tapered before, but it was only for a week before my first half marathon. Now, looking back at that time, I should have given my body a little more time to heal. But the brain’s constant pushing to be sure you can run that far, that you’re ready enough, can overpower common sense. So, I downloaded coach Loran’s training program. If it says 3 miles, I run 3 miles. It’ll seem like I just started by the time I finish, but I need to fight the battle with my brain that is constantly pushing me to keep going. So, for the next two weeks, I taper down the miles, rest my body, and tell my overexcited brain to take a vacation. I’ll be calling on it come race day.